What Is Wrong With Our Fragile NFL Kickers? There is an excellent chance that one of the two monumental playoff games this Sunday will hinge on a crucial field goal attempt—and an even better chance that whoever is asked to kick it will miss. Now you might think that kickers on the playoff teams are among the best in the league. You would be (mostly) right. Nine of the 12 playoff teams had a kicker above the league average. Yet, there seems to be an inverse relationship between the quality of the kicker and his playoff performance. Neil Rackers led the league this year by going 16-for-17. He missed two in the playoffs, including a potential game-winner. We all know about Nate Kaeding's troubles. (32-for-35 in season, 0-3 playoffs). Jets opponents are 0-5 so far, which has been incredibly beneficial to them. There were only six misses total in all of the 2008 playoff games. I know, I know. Small sample size. 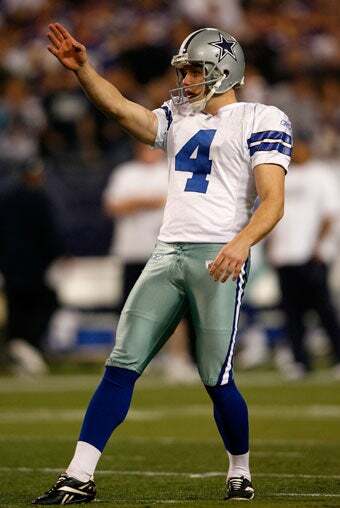 Still, the lack of reliable field goal kicking is a glaring issue. It's annoying enough that so many major football games come down to such a highly specialized skill that seems to be performed in direct contradiction to what the other 50 or so guys on the team are trying to accomplish. Do they also have to perform it so badly? I know there's nothing in the rule book that says a mule can't kick a football, but maybe there should be a rule that makes hoofed mammals mandatory?